Maps are based on true, or geographic, north, i.e. the north pole at 90�N. However, magnetic compasses point to Magnetic North, a mineral deposit in the High Canadian Arctic. In lower latitudes, the angular difference between True North and Magnetic North is compensated for by a value known as Magnetic Variation. But to further complicate matters, Magnetic North is not a fixed point on the earth's surface but is constantly on the move; therefore magnetic variation must be recomputed on a regular basis. 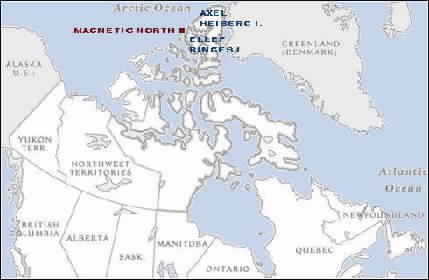 In the past 100 years, Magnetic North has wandered approximately 600 miles to the north to its present location near Ellef Ringes Island in the Canadian Arctic. Map based on a BC s&r map. Sir James Clark Ross first determined the location of the North Magnetic Pole in 1831. 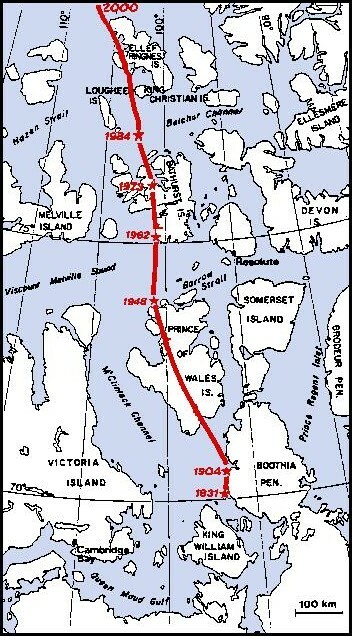 Some seventy or so years later, in 1904, Roald Amundsen re-located the pole during the course of his 1903-1905 transit of the Northwest Passage in the sloop Gjoa. Since that time the pole has followed a meandering path northward to its present location near Ellef Ringes Island.